2018 hunting dates: Nov. 2, 3 and 4. WAPAKONETA — Joe Sawmiller of Wapakoneta is not a veteran, but he supports veterans. He has formed the “Lt. Col Ted Epple Veterans with Disabilities Bow Hunt,” which is under his 501(c)(3) corporation, Hunting with Hero’s Inc. This is the 10th year for the hunt, an event that has done more for disabled veterans than just bagging deer. Sawmiller was familiar with sportsmen programs, as he had been with the National Wild Turkey Federation. “I broke off with them and started my own hunt,” said Sawmiller. His brother-in-law worked at Joint Systems Manufacturing Center in Lima, and he told Sawmiller that Lt. Col. Epple was a really good guy to work with. He informed Sawmiller that there were a lot of deer in the facility. That sparked Sawmiller’s idea for a hunt. “I got hold of Lt. Col. Epple and talked to him and told him that for the place that it is, a disabled vet hunt would be really good in there. And so he jumped on it, and then we’ve been doing it ever since,” said Sawmiller. Disabled veterans are paired up with guides or volunteers. These guides help the veteran in any fashion that they need while bow hunting for deer. All expenses are paid for the veterans during the three days in November the veterans hunt. Veterans come from all over Ohio to partake in this activity. 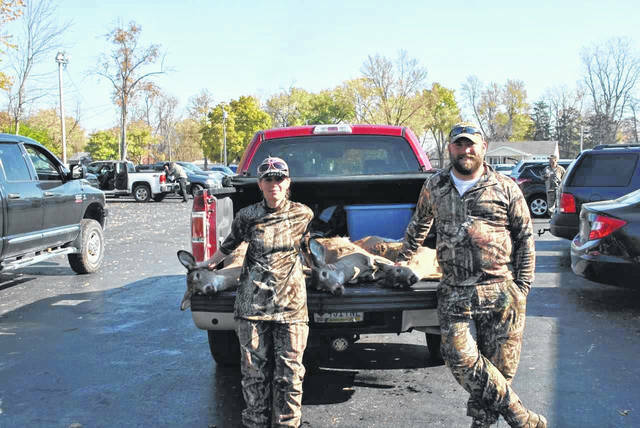 The veterans, along with their guides, are taken to places such as Husky Energy, Johnny Appleseed Metro Parks, Joint Systems Manufacturing Center, Brad Core’s, Brad Steinke’s, County Line Investments and Frank Myers’ to hunt. “We started with nine disabled veterans the first year, and last year we had 48. It’s grown really fast,” said Sawmiller. Sawmiller enjoys getting these disabled veterans out and moving around. “We get some really good letters back from them. Some of the stories of where they are at as far as their emotional stability, and things like that when they come to the hunt they enjoy themselves so much and it picks them up a little bit. That’s the whole goal,” said Sawmiller. “What it really does, beside the hunting thing, Joe Sawmiller, the volunteers and his family that put it on, it keeps people alive, is what it does,” said Ron Leach, of Marshallville, Ohio. Leach is an Army veteran having served in Desert Storm and then in Iraq. He suffers from Post Traumatic Stress Disorder (PTSD) and Traumatic Brain Injury (TBI). “The first time I went there I was in a bad spot with PTSD. You feel awkward anywhere when you don’t know anybody. But you know, you have the veteran thing, it starts off, well like cats in a room full of rocking chairs. People start talking and then the vets start busting each other with the different branches of service, they tease each other and stuff,” said Leach. For other veterans, they plan their lives around the hunt. “It’s an experience where every year — I set my vacation days based around that weekend,” said Dustin Baker, of Hamilton. Baker, who served in the Army for eight years, heard about the Hunting with Hero’s event through the Wounded Warrior Project. He suffers from PTSD, as well as back and knee problems. He has bagged two or three deer throughout his five years of attending the bow hunt. “But at the end of the day, that trip really isn’t about killing a deer. It’s about going and hanging out with a bunch of guys and other veterans and getting to talk with them and stuff like that. We become pretty close. It’s a pretty neat experience,” said Baker. For Jacob Tate, of Lima, the hunt is about the camaraderie. Tate is an Army veteran, having served eight years. He suffers from PTSD, Traumatic Brain Injury and shrapnel wounds to the arms and head. His knees and back are bad, as well. Callie Geary, a Navy veteran with PTSD from Stephensburg, Kentucky, echoes the same sentiment. She has hunted once with the Hunting with Hero’s group. She took two deer and missed a third that first year. While the initial idea came from seeing the deer at Joint Systems Manufacturing Center, for Leach, seeing the rows and rows of tanks brought back some bad memories. There are many volunteers that help with the hunt, according to Sawmiller. “Our group of dedicated volunteers spend countless hours talking to sponsors, baiting our hunt areas, building blinds and hunting one on one with these heroes,” said Sawmiller. The veterans get familiar and bond with their guides during the hunt. “We become pretty close with the guides who are guiding you in our areas and getting to know their families and stuff like that,” said Baker. The guides are there to lead in the hunting, but also conversation. “I don’t know how Joe finds these people. I’ve never went where anyone has come up and asked how many guys I killed or talking stupid stuff. Not once, it’s hey how are you doing and then you get to talking about their family and yada yada,” said Leach. The end of the hunt is hard for Leach. “The worst thing for me with Hunting with Hero’s is Sunday afternoon when you leave. I have a hard time with goodbyes,” said Leach. While Sawmiller had the initial idea, he is quick to thank the services that keep the hunting going. “The only reason we can do this is because of groups like the SOS Project, which is a group of people at the Elmview Pub that does fundraising for veterans activities. They give us money every year. And then the UAW Local 1219 at Ford Motor Company, they are the same way. The last three years these guys have stepped up and done fundraisers to help us out. Cody Bell and a bunch of his friends offered to put on a golf outing as a fundraiser for us. They have been doing that for seven years now. This is the first year that they’ve sold out — they have 32 teams coming to the Oaks Golf Course on June 2. It’s a big community-wide event,” said Sawmiller. 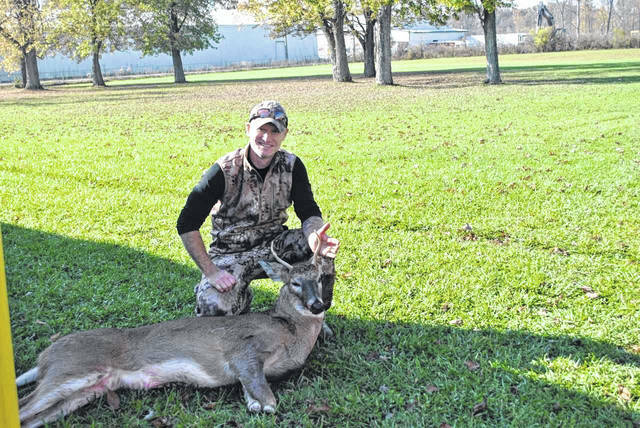 An out-of-state deer hunt was added in 2017 in Virginia. Sawmiller has family ties to 200 acres of prime deer hunting area. Coyote hunts are ongoing as well. Last year, eight disabled veterans hunted in Virginia. According to Sawmiller, just knowing someone cared enough to say thanks lifts and ignites his spirit. For more information on the “Lt. Col. Ted Epple Veterans with Disabilities Bow Hunt” or Hunting with Hero’s, contact Joe Sawmiller at 419-204-2805 or email huntingwithheros@hotmail.com.